Despite missing basically a full season last year and being 30 years old this season, Adrian Peterson has been balling out for the Minnesota Vikings. The nine-year veteran has 633 rushing yards and three touchdowns on 4.5 yards a carry so far this season. According to ESPN, Peterson is on pace for the fifth-best season ever by a 30-year-old running back. AP, however, believes he can continue to defy the odds. He hopes to play for 10 more years. "If God's willing, I'll just be able to walk away from the game at the highest level whenever I decide," Peterson said. Peterson is always optimistic about his skills, potential and ability. We all remember a few years ago after his 2,000-yard season when he said he could rush for 2,500 yards. It's definitely a big stretch, just like how he can play until age 40. Peterson's current contract with the Vikings ends when he turns 32. However, he thinks his relationship with the franchise is strong enough that they would give him another contract. He adds that he'll only retire in his early-30s if he wants to spend more time with his children. "I think if I'm blessed to play [that long], I'll get a feel. 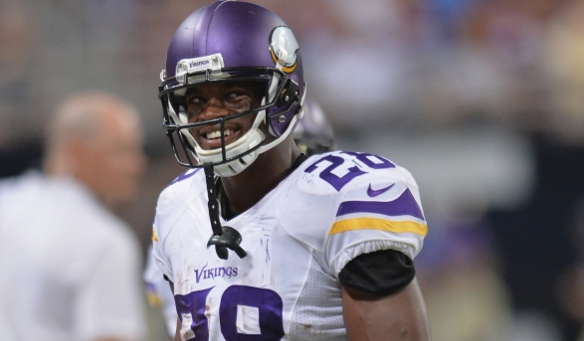 I think I'll go off my gut feel," Peterson said in August. "I think I can play for a long time, but I'm just going to take it one year at a time and see how I feel, because I did enjoy myself, realizing how much I was missing, as far as my kids. Just doing simple stuff, taking them to school, picking them up, that was fun to me. I missed that. Unfortunately, it's during football season. So that could bring my career to an end earlier than expected."